First a disclaimer: this is definitely not what I wear to tend my garden. 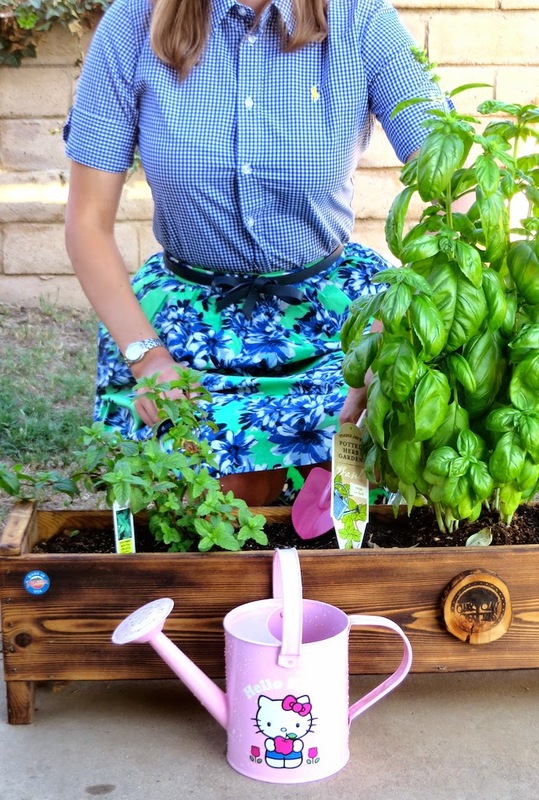 I have wanted to do a post featuring my herb garden for a while now and I thought my outfit was a bit garden/farm inspired due to the floral print skirt and gingham shirt. So getting back to my herb garden, I planted it a few weeks ago in the hopes of having a supply of fresh herbs for cooking all year round. I am not sure that the end of August was the best time to plant the garden, but I don't exactly have a green thumb, so I am just kind of winging it and hoping for the best. Of course I need some special Hello Katie Girl accessories to tend my garden. 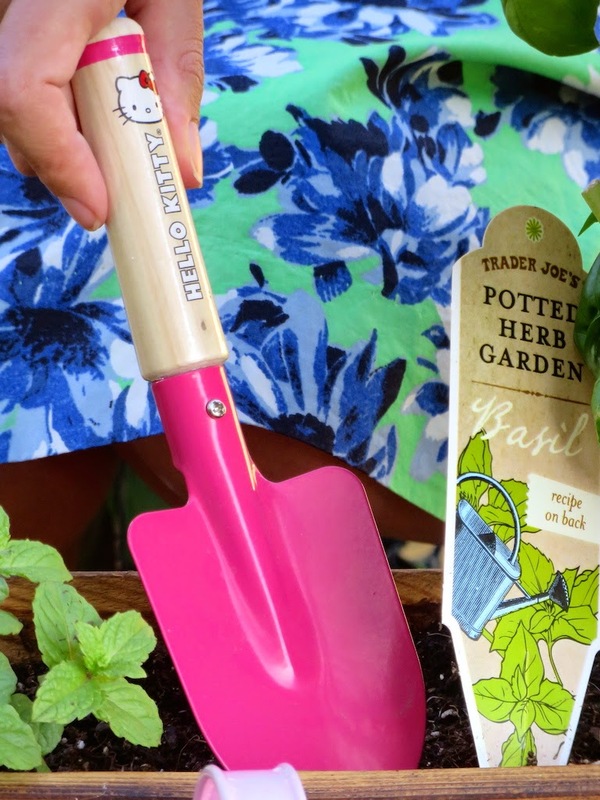 Lucky for me these Hello Kitty garden tools were on clearance this summer at Target. 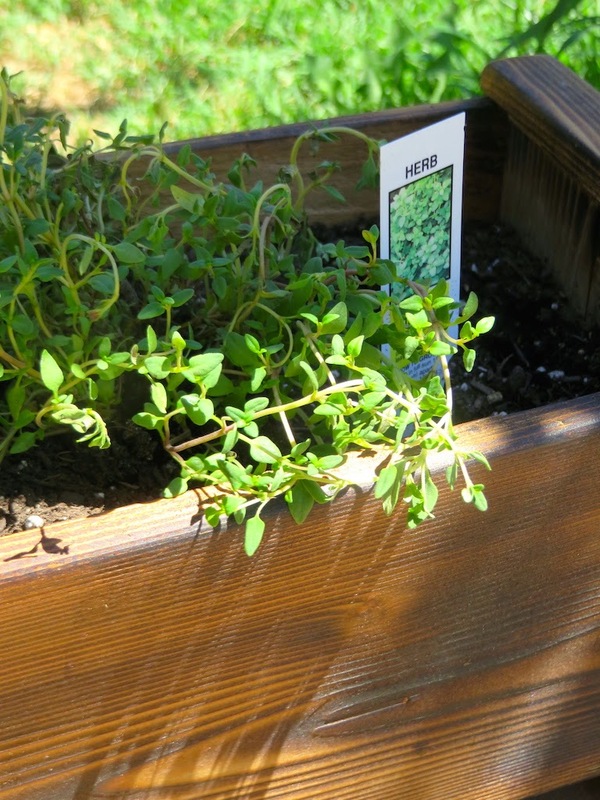 So far I am growing mint, basil and thyme in my herb garden. I'll just be honest, the mint is mostly for mint juleps and mojitos. The other two are for cooking. 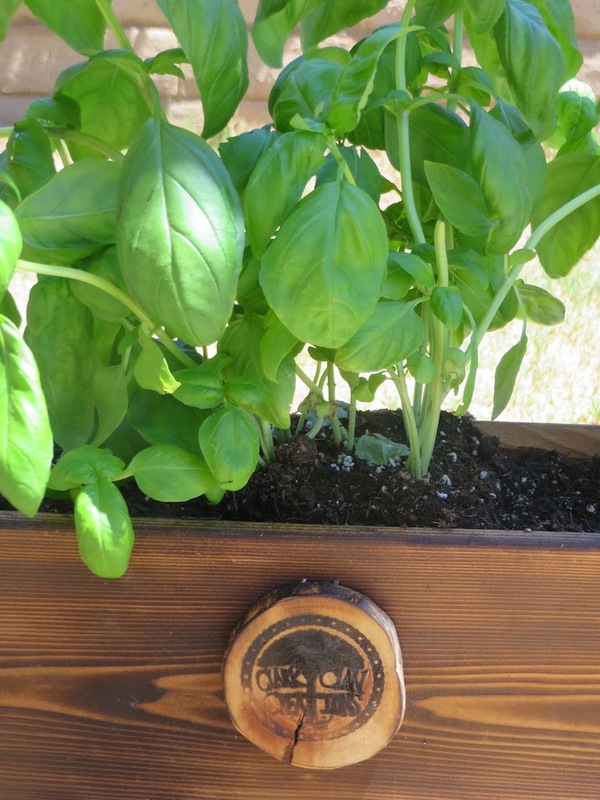 My wooden planter is from Etsy and it's handmade in Montana. I actually bought it a couple of years ago and it's been sitting in the garage all this time. I am glad I finally decided to whip it out and start my garden. 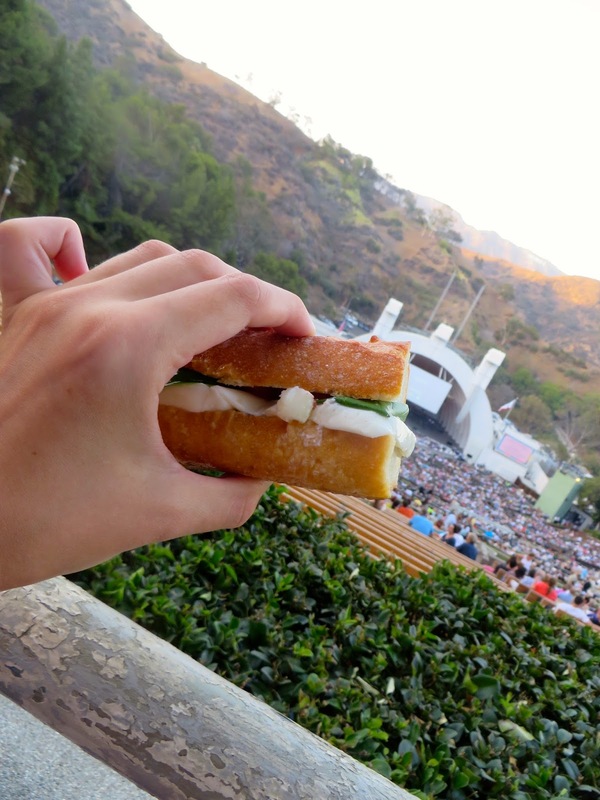 One of the first uses for my garden was to make sandwiches for my husband and me on our most recent trip to the Hollywood Bowl. 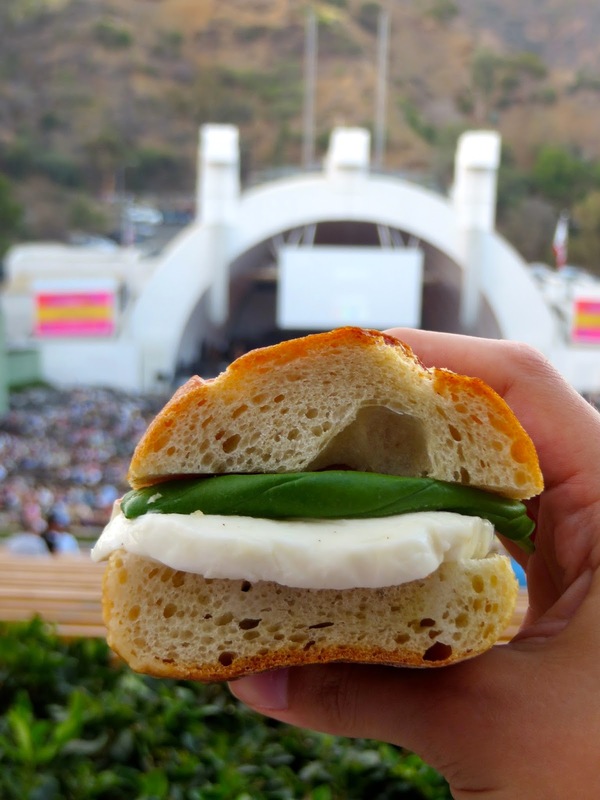 I love to picnic before the concerts at the bowl, usually taking wine, cheese, bread and other snacks. Last weekend we decided on a Caprese sandwiches. Below you will see the journey of this sandwich from garden to bowl. It's insanely easy to make and insanely delicious when you use tomatoes and basil straight from your garden. This sandwich starts with only four ingredients: fresh basil, fresh mozzarella, tomatoes, and french bread. (Plus salt, pepper and olive oil, so I guess that's technically seven.) The tomatoes are from my garden, but the plant was ravaged by unsightly hornworm caterpillars before I could photograph it! Homegrown tomatoes just have a taste that can't be replicated by store bought tomatoes. Drizzle the bread on both sides with extra virgin olive oil and Balsamic vinaigrette. Top bread with basil and a generous helping of sliced fresh mozzarella. Look how luscious and green my basil looks! Who says I can't have a green thumb? Top the basil with sliced tomatoes. I like to add a little salt and pepper to really bring out the flavor of the tomato. Now the sandwich is ready to go! It was almost too easy. I would recommend for a little extra flavor adding pesto or salami to the sandwich too. I decided to go simple to let the fresh ingredients really shine, but you can certainly get creative with your sandwich creation. Now I'm ready to wrap it up. 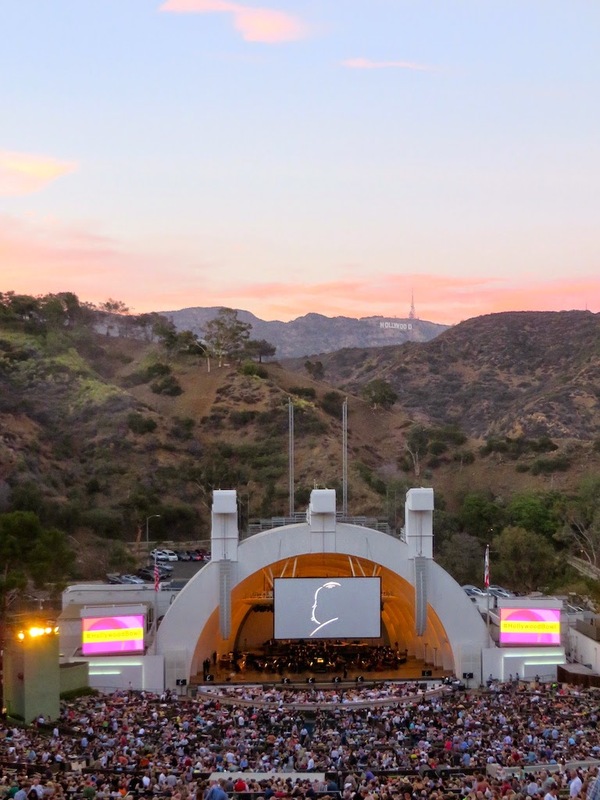 It's off to the Hollywood Bowl! The Hollywood Bowl sort of looks like a mouth and in the pictures below I tried to capture that effect. Look out sandwich you're heading for gaping maw! Now it's finally time to stuff my face with this delicious creation. Yum! Thanks for reading through this epic journey of my sandwich! From garden to bowl, it's now complete! I think I can sit back, relax and enjoy a drink. Cheers! How fun! You got some super sweet pictures too! I'm drooling over that sandwich! Thanks Lauren! The sandwich was really yummy and it was so fun taking pictures at this location. Your disclaimer is hilarious! That skirt is amazing! I found it at J.Crew right after I saw The Other Woman but they didn't have my size. I love it! That's my kind of sandwich. I make similar ones and I also add salt+pepper to taste, over the tomatoes. This type of food is PERFECTION!